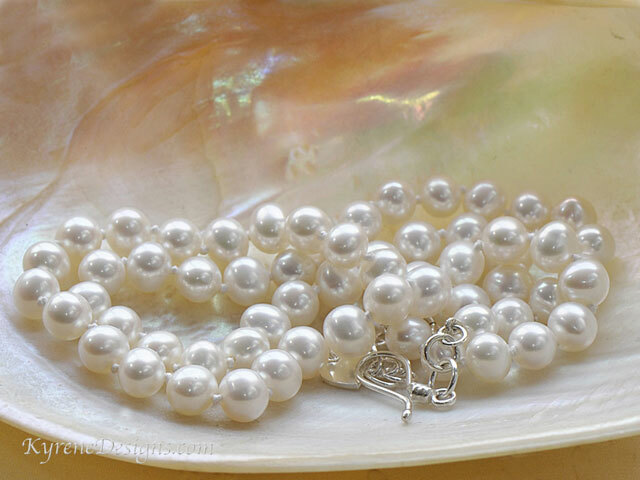 Single strand of lustrous high grade cultured white pearls; this elegant heirloom quality necklace drapes beautifully as I've knotted each pearl with fine pure silk, protected at the clasp by french wire, the standard for all good pearl jewellery. Made to Order. Also suitable for your wedding jewellery. Length: 17 inches. Pearl 6-7mm. Has 'easy to use' sterling silver hook clasp, plus 2" extender. Options: contact sales@kyrenedesigns.com for bespoke length, different clasp, matching set, or a gold version. 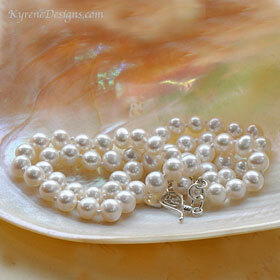 View our materials page for information on freshwater pearls.